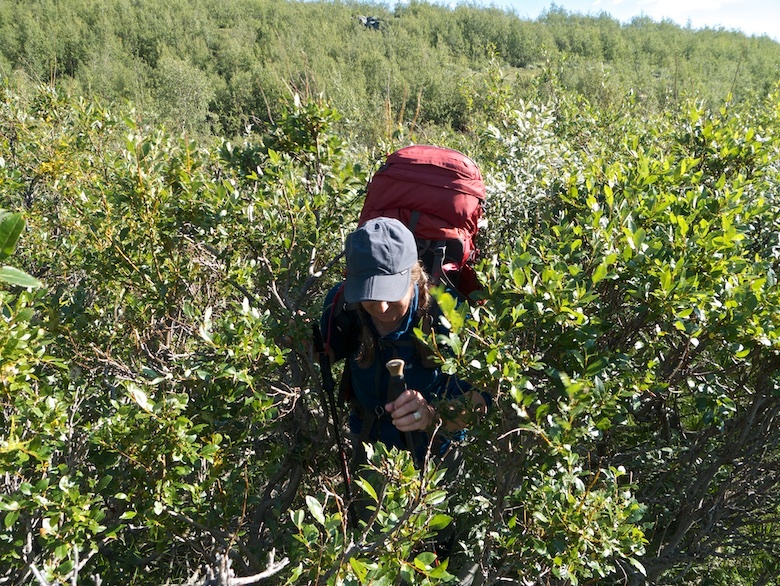 You can never really fully appreciate dwarf willow until you have tried to force a path through it on a hot day with clouds of mosquitoes and horse flies biting. The first two thirds of our Sarek trip was dominated by an unrelenting sun, powerful through the crystal clear Arctic air. The mosquitoes should have died off at this time of year but the heat had given them a second chance. They were very hungry! When the rain came it came with a vengeance and we were faced with flooded paths and rivers. On the final night rodents ate our tents. Sarek can bite but it provides plenty of rewards to those willing to tough it out. 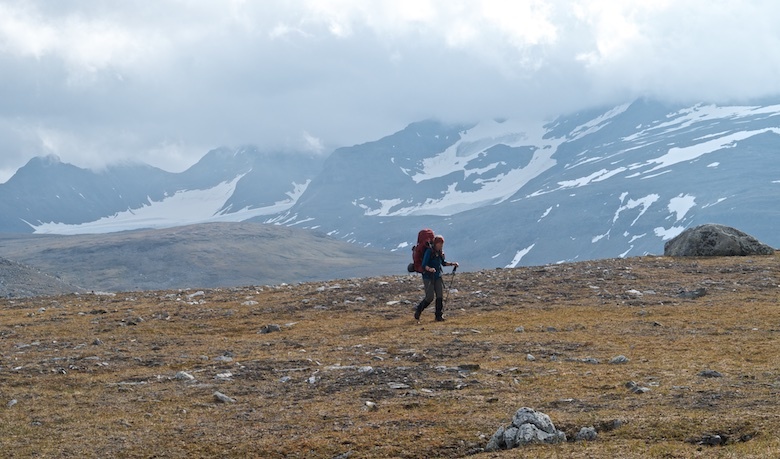 The scenery is out of this world and the sense of remoteness is hard to beat in Europe. I’ll do some trip reports over the next couple of weeks, but in the meantime here are a few photos giving a flavour of the place. 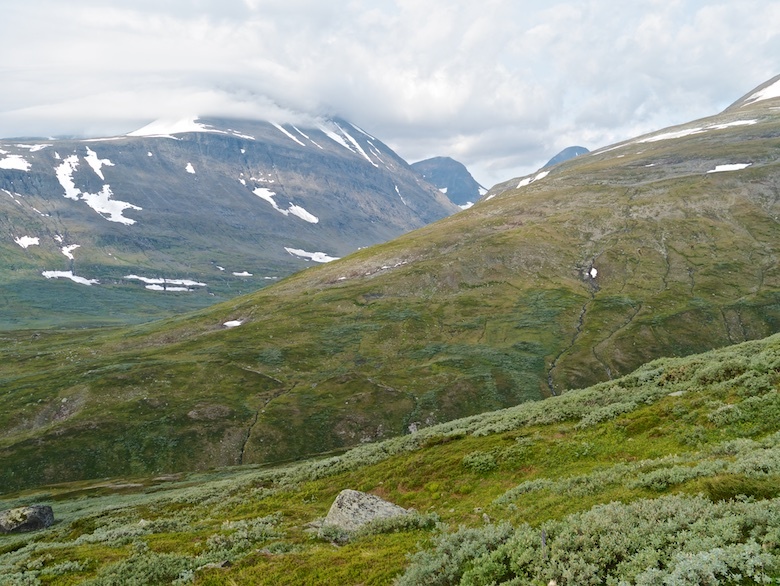 If I have pressed the right buttons in the right order Social Hiking will show a live map of our Sarek route from 5.00pm on Saturday afternoon. 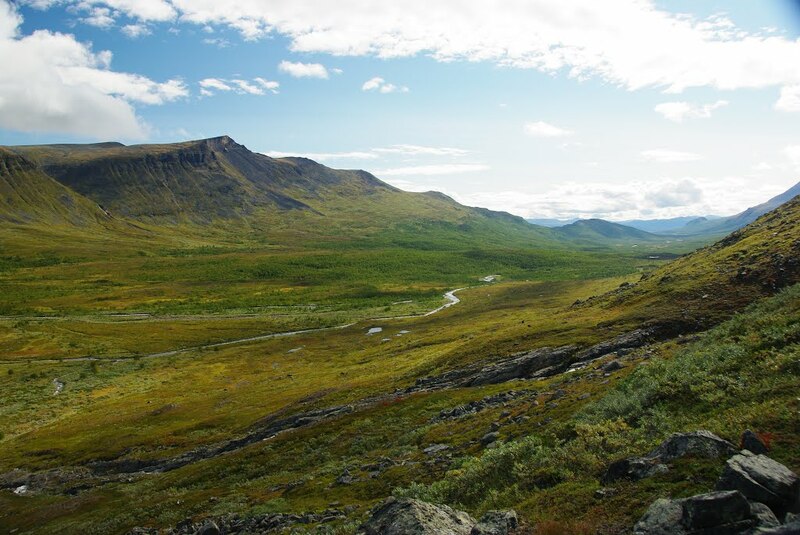 Being north of the Arctic circle, having a maritime climate and peaks that reach two thousand metres means that Sarek’s weather can be unpredictable. One statistic I read said that on average it rains two days out of every three. During the summer there can also be large temperature variables from day-to-day. 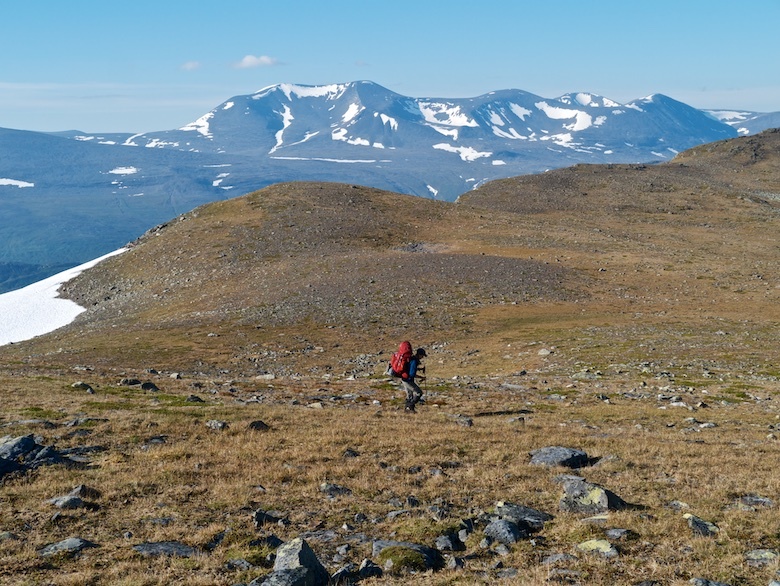 The current forecast is showing that it will be 21C when we arrive in Kvikkjokk but three days later the maximum day time temperature at 950 metres will be 4C. I’m sure when I look again in a couple of hours the forecast would have changed again! 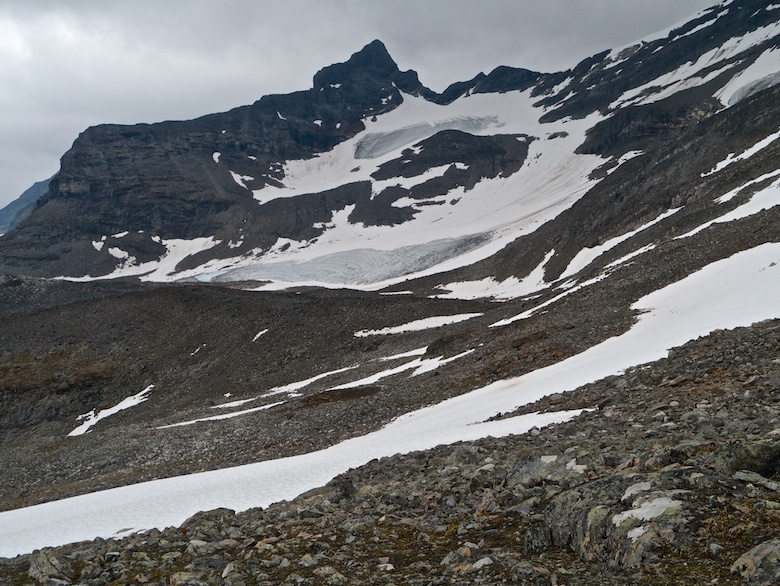 With the exception of the first and last few kilometres our entire route will be above 600 metres, even in the valley bottoms. 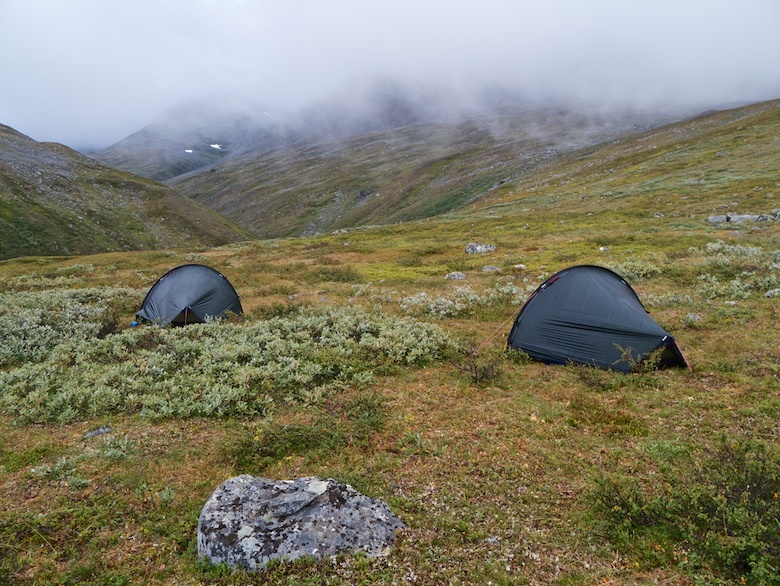 We climb above 1200 metres (without climbing any peaks) and we will often be camping above 800 metres. 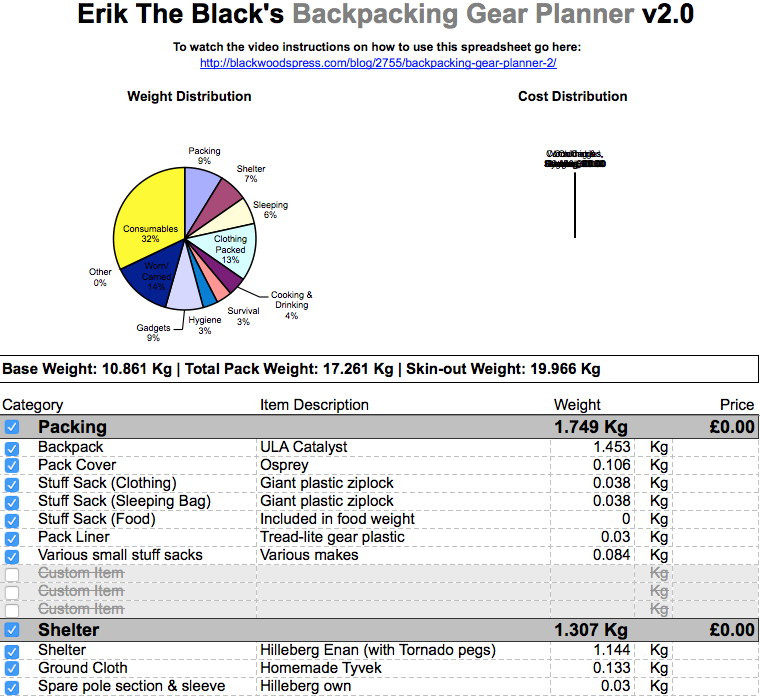 That on top of the fact that in the middle of our hike we will be three to four days walk to the nearest road, makes planning what gear to take a difficult task. This is what is currently sitting in a big pile ready to be packed tomorrow night. On Saturday afternoon a bus will deposit Chrissie and myself at the end of the road at Kvikkjokk, above the Arctic Circle. 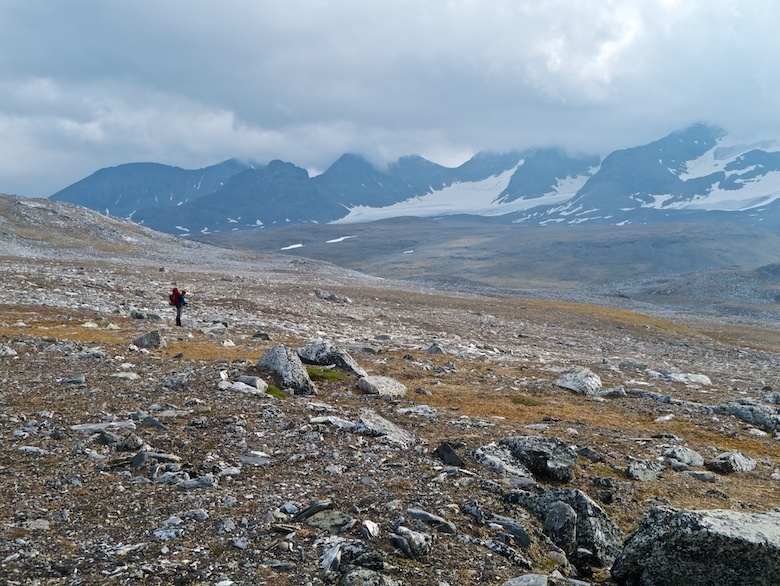 From there we will head into the wilds of Sarek for a week, exploring some of its hidden valleys and exposed plateaus. 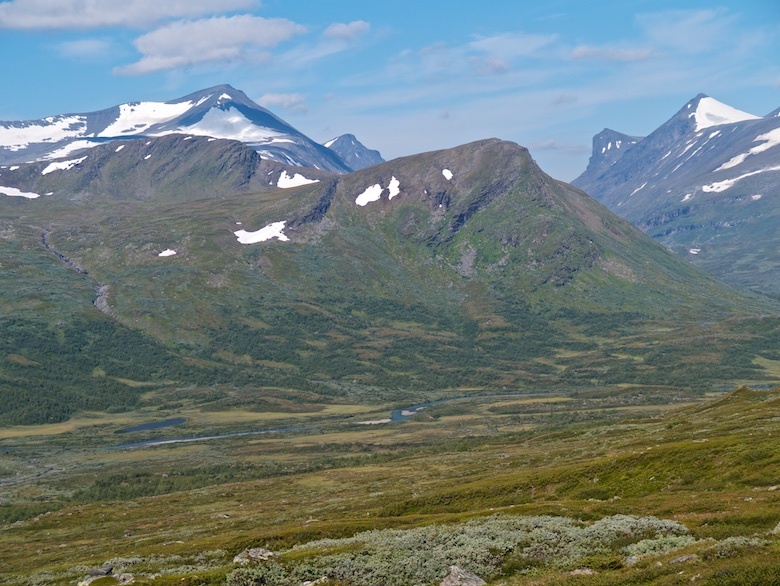 I went to Sarek last year on a longer trek, visiting some of the more popular through routes. This trip is shorter but potentially more committing, a bit more off the beaten track and climbing to 1200 metres. The planned route is 94 kilometres. There is no plan B.
I have spent the last couple of weeks tracing our route on Google Earth, from which you can pull photographs that have been submitted. The photos below are bang on our route, in chronological order. Just looking at them is giving me butterflies, both of nerves and excitement. Please note that these photos are not mine but taken from Google Earth, clicking them links through to the original page. Although only a couple of hundred metres from the thundering A628, the car park for Arnfield reservoir feels a million miles away. 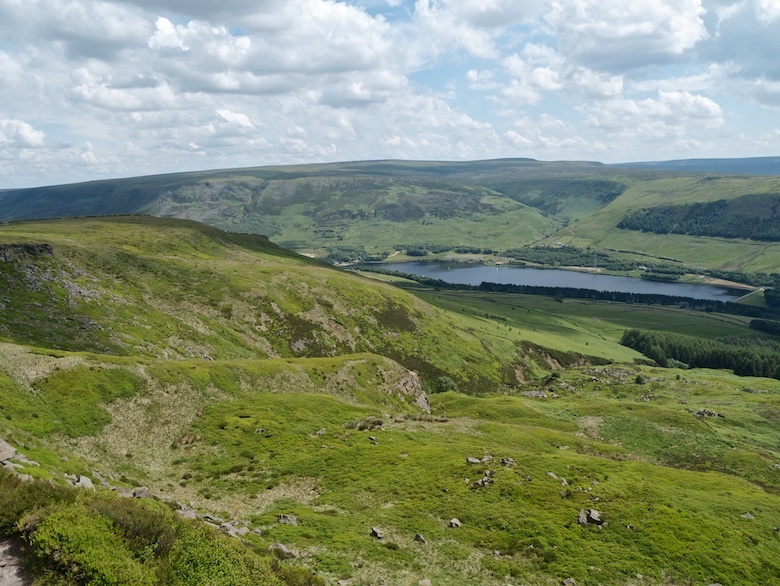 Turn your back on the lorries and noise and the view is the western edge of the Peak District moors. After parking I asked at the cafe if it would be ok to leave the car overnight, they confirmed that it was so we shouldered our packs and picked up the track around the reservoir. It’s been a while since I have backpacked with my good friend Rae, so we caught up with each other, accompanied by the crunch of gravel under our shoes. 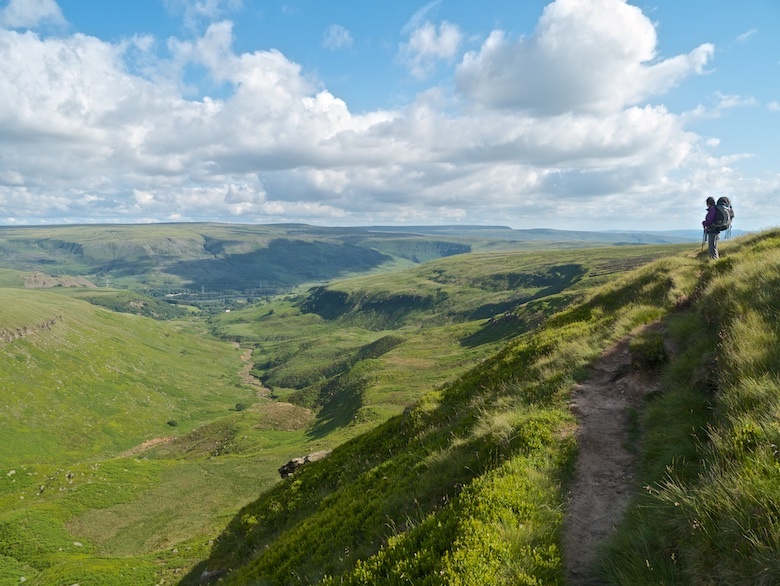 It was a steep pull up the Pennine Bridleway and we were soon slowing, the early afternoon proving to be warm under the summer sun. 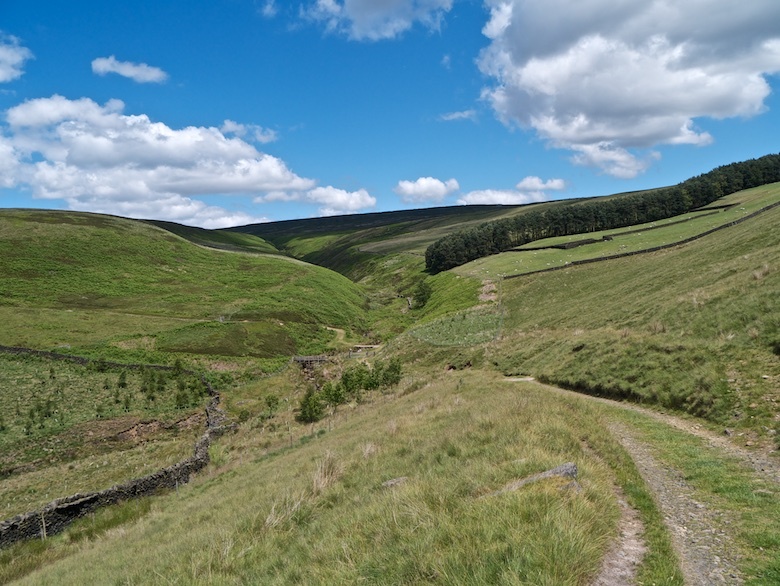 A concessionary path is shown on the OS map above Ogden Clough and Ornes Moor. We found the start but it was quickly lost amongst tussocky grass, heather and bracken. 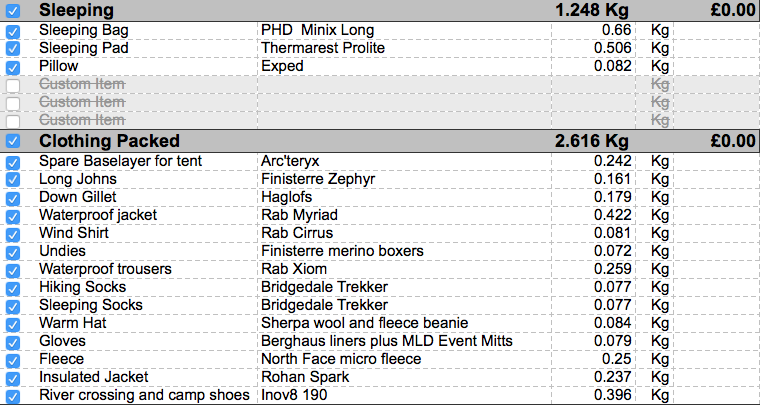 Not particularly tough but enough to warrant the pulling on of gaiters to stop my shoes filling with prickly heather. 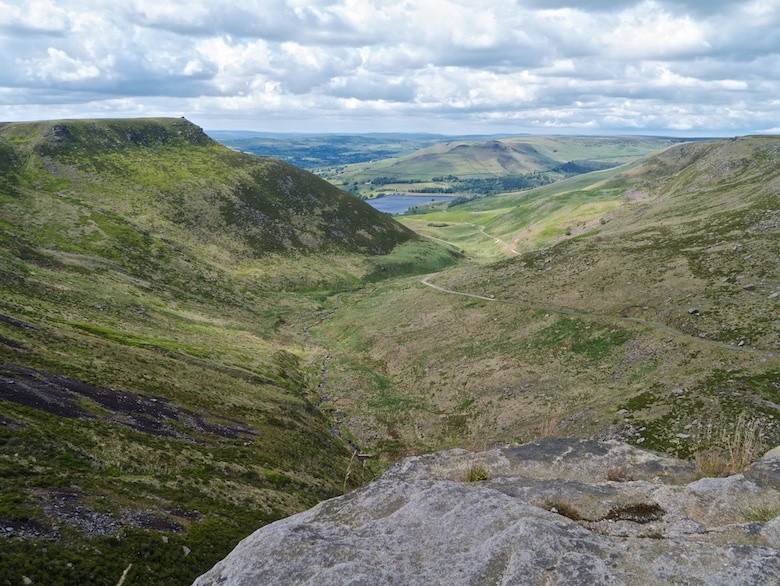 The views were good towards various conurbations and across the Cheshire plain to the west. We guessed that hills on the far horizon were in Wales. 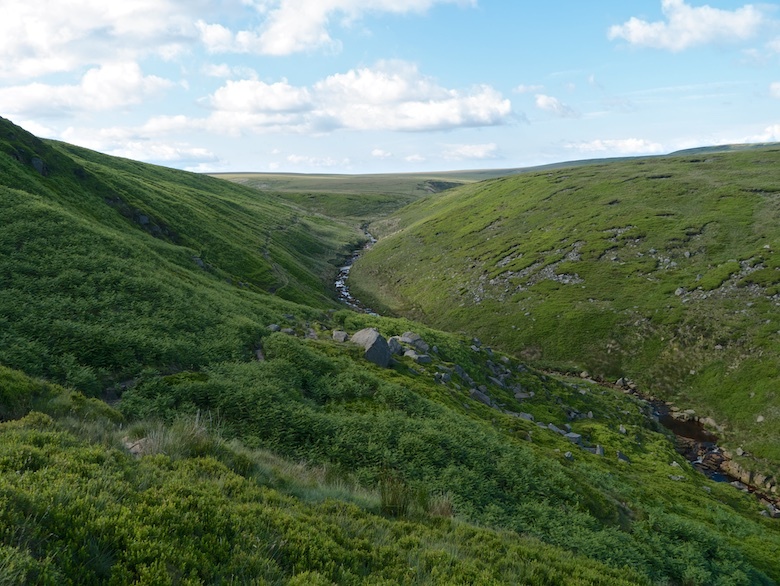 We eventually picked up the path again as it crossed Ogden Brook, an unmistakable groove through the heather. 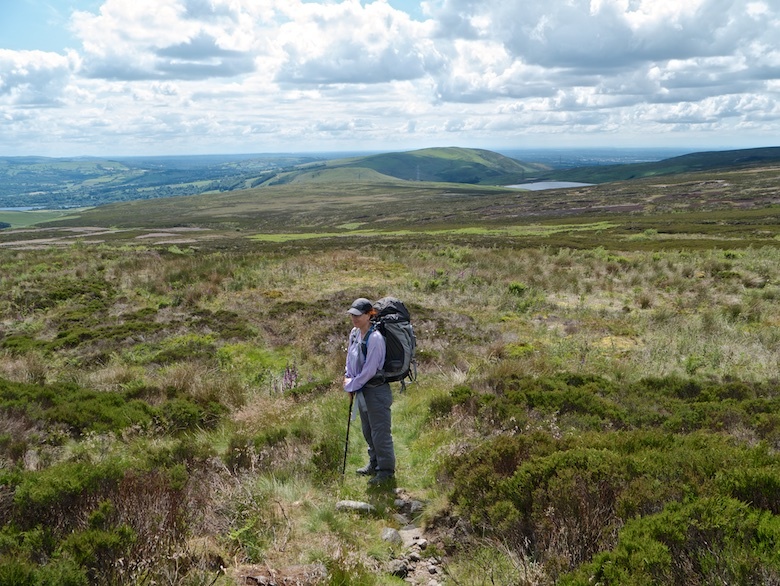 At the top of Ornes Moor we came to an area simply called Wilderness. 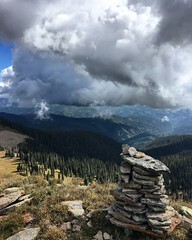 I’m not sure about the wilderness tag but I would imagine that it would be tough going after plenty of rain or when the cloud has come down. 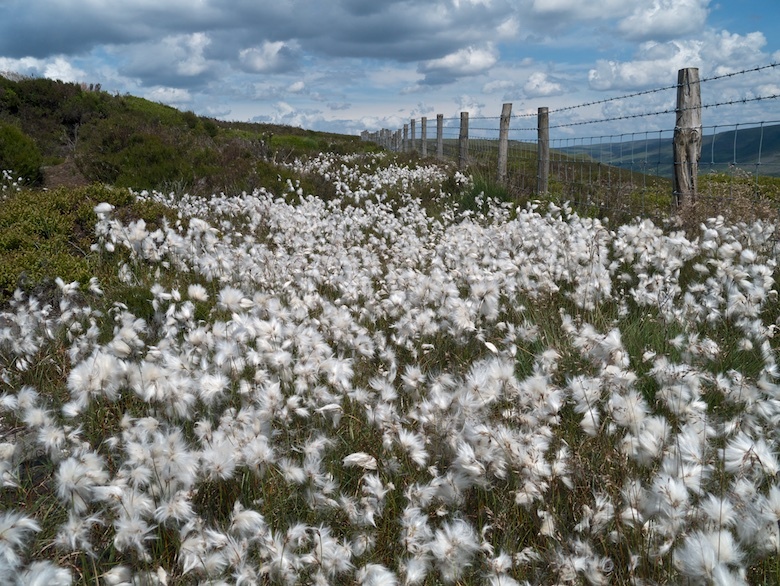 The large areas of bare peat were easy enough in the dry conditions, when wet you would be at risk of losing a shoe or simply disappearing altogether. The crunchy bog slog however was worth it when we got to the escarpment overlooking the deeply incised Chew Valley. Pretty much right on the edge of the urban sprawl it is still a spectacular place, as good a spot as any other in the National Park. 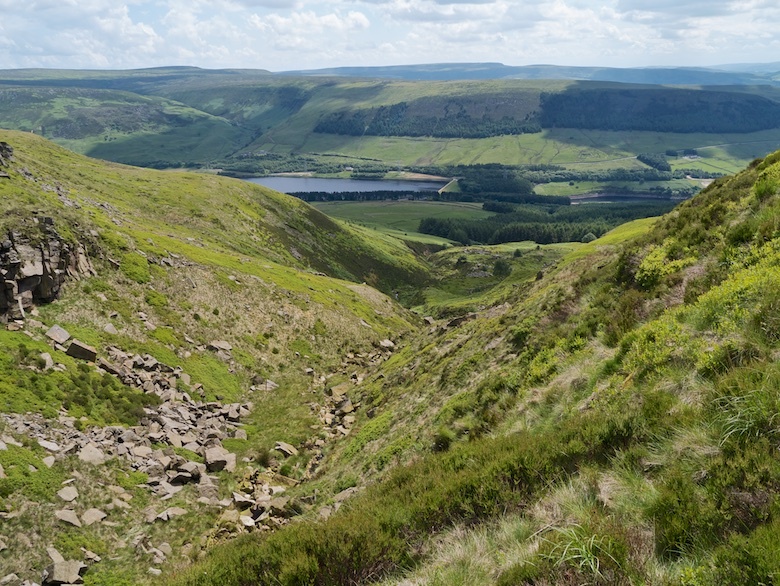 The area around Dove Stone reservoir can get very busy and there were a few families walking up the access road to the higher Chew reservoir. However we had the edges to ourselves. 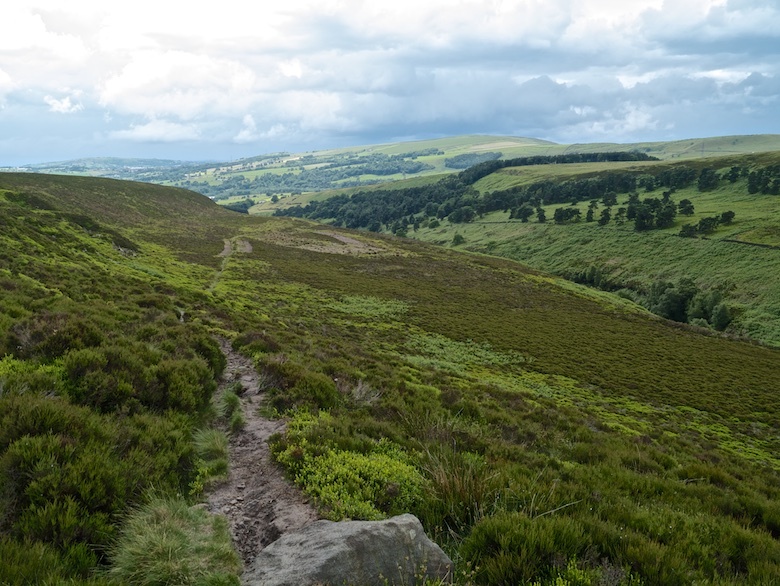 The narrow edge path took us to Chew reservoir where a well-defined path led across Laddow Moss to the spectacular Laddow Rocks. 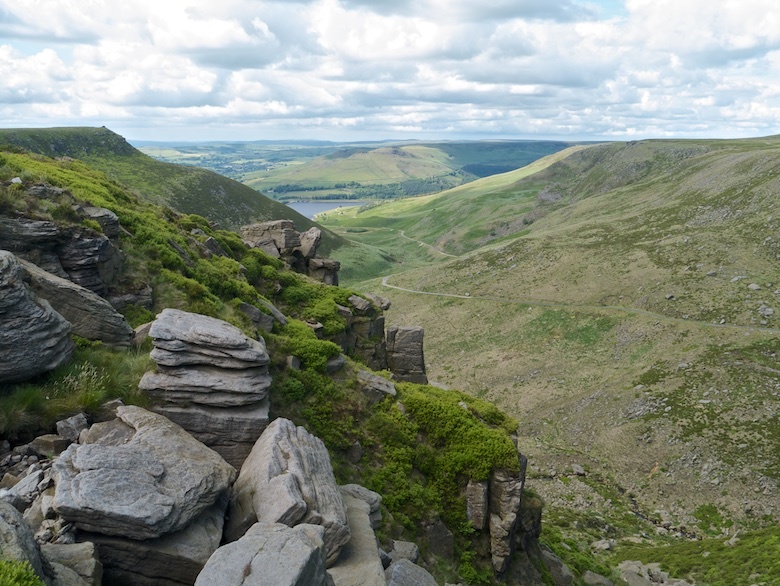 With exposed drops below, views to Bleaklow and big fluffy clouds drifting across the sky it was an impressive place to be in the late afternoon light. 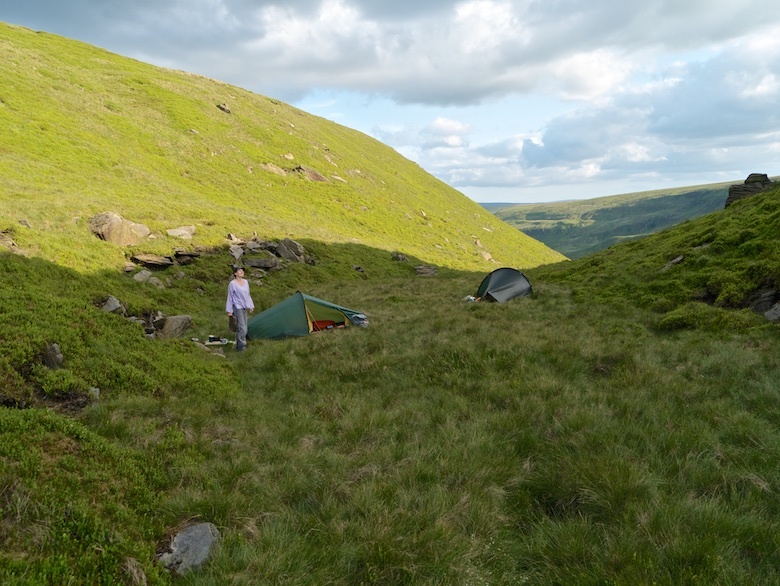 I have established a favourite place to wild camp nearby, so we followed the Pennine Way for a bit before leaving it for wet trackless ground. 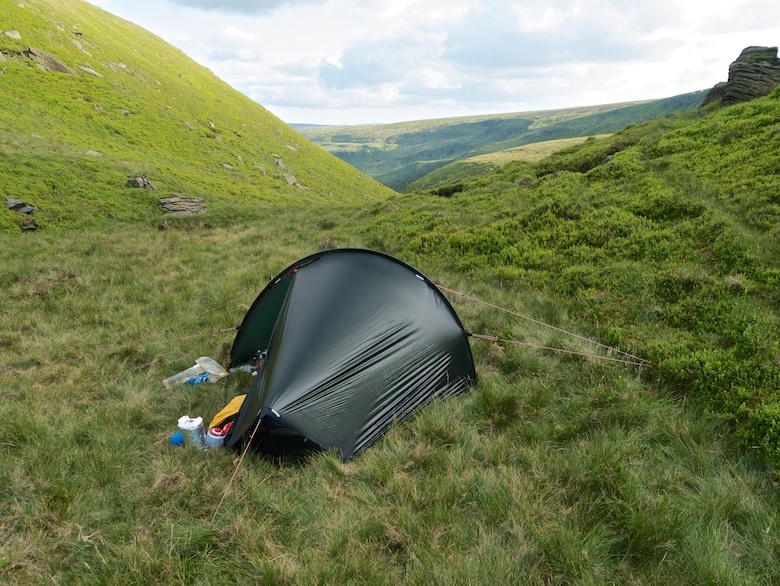 The secluded little spot was as good as last time so tents were quickly pitched. 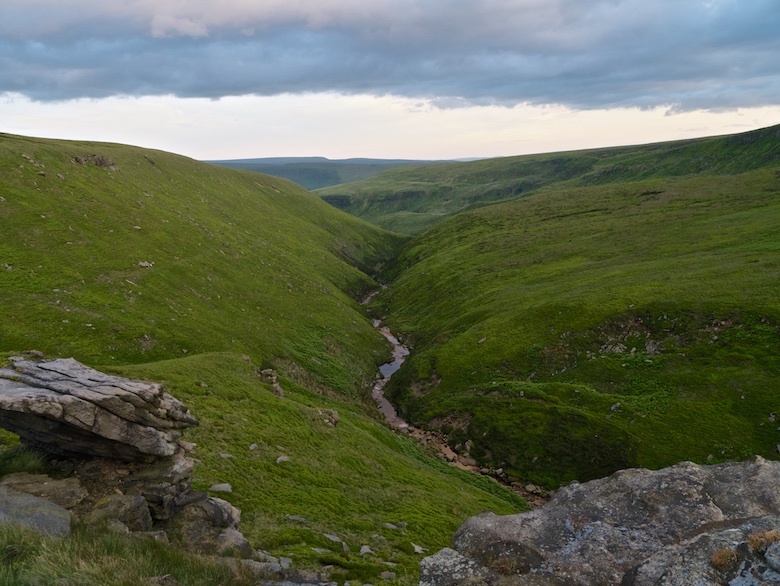 After dinner I had a little wander around some nearby outcrops but was soon driven back into my tent by the midges. I had for the first time brought with me just a light summer quilt, something I will not be repeating. Despite a relatively mild summer night I found myself cold in the early hours, drafts sneaking in from all angles. I was thankful for the sun that warmed me up in the morning. So glad in fact that I slept through the alarm that I had set. 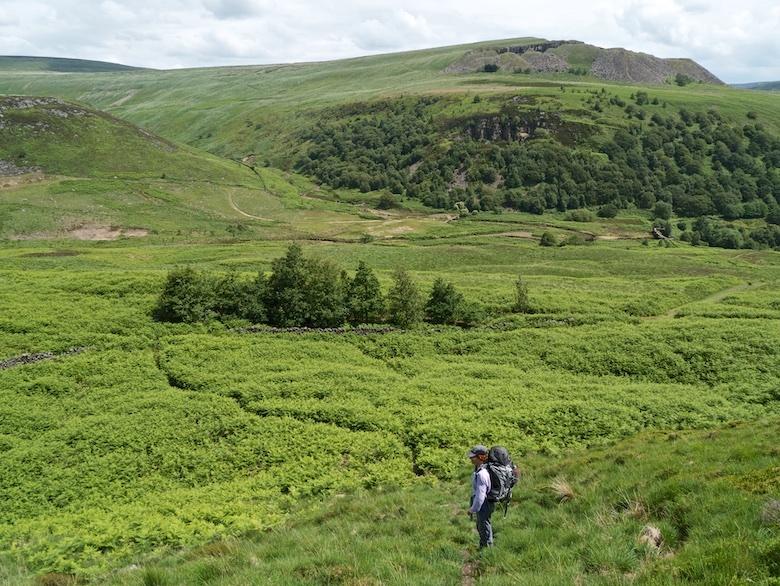 After a leisurely start we were once again heading along the Pennine Way, south this time. 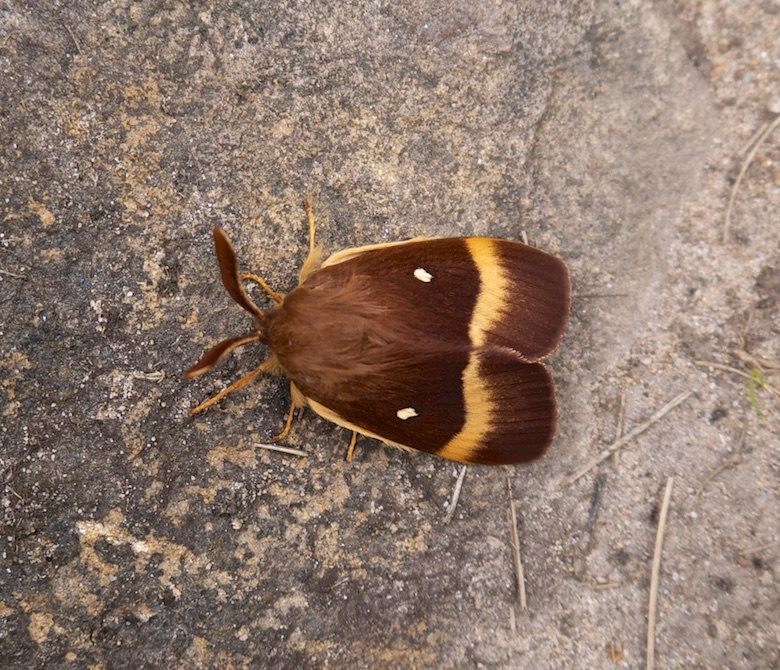 On the path we came across a beautiful male Northern Eggar moth. I picked it up to move it to somewhere It would not get squashed as there was a day hiker chomping at the bit to get past (he had no interest in stopping to look at a moth). 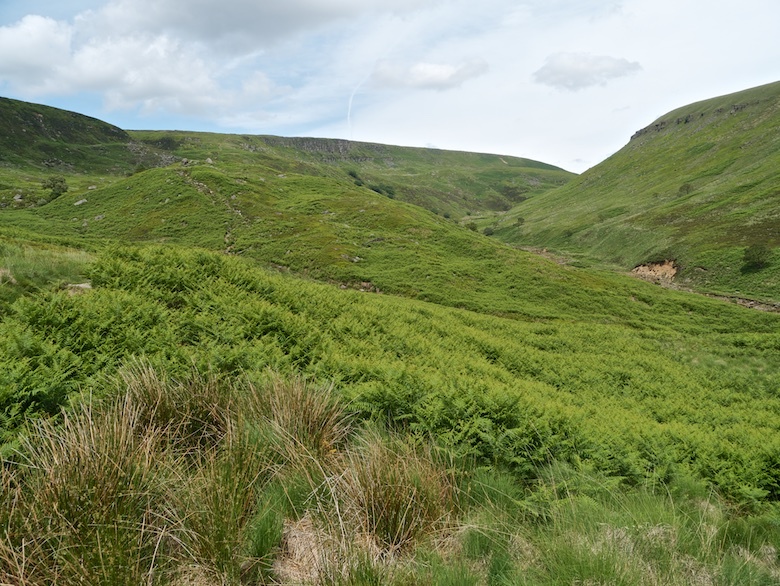 Our route took us nearly all the way down to Crowden before we picked up a path through the bracken that climbed up towards Millstone Rocks and Lad’s Leap. 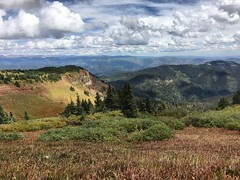 This is a route that I have only done once, many years ago. It is memorable because I left a library book up there one sunny afternoon, only realising on the train home. It is obviously long gone now, and the fine was paid anyway. 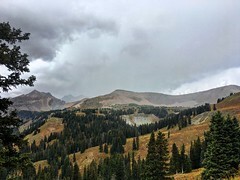 Throughout the late morning and early afternoon the clouds had been building from the west. A brooding wall of murk that had blotted out the long distance views. Descending into Arnfield Brook the storm suddenly hit. The wind picked up, gusting close to gale force and big fat drops of rain fell. Thunder rumbled above us, dark clouds rolling onto and covering the moors. I was thankful that we had descended in time.